Time goes on, and Toyota has developed a new UR family of powerful V8 engines to replace the old UZ engine family. 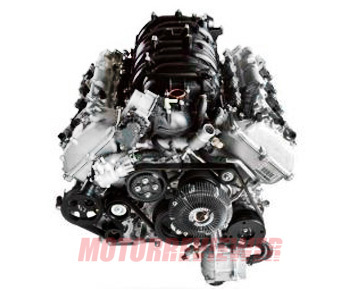 The 1UR-FE is a Toyota’s 4.6-liter entirely aluminum V8 engine. It replaced the old 2UZ-FE engine offered basically in Toyota’s trucks and pickups (Toyota Tundra, Toyota Sequoia, Toyota Land Cruiser, etc.). The Toyota 1UR-FE engine was firstly introduced in Lexus models for Middle East market, and after 2010 it became available for some Toyota’s pickups and trucks in the US and other countries. Let's take a closer look at the main engine components of the 1UR-FE. One of the key features is the new aluminum alloy cylinder block with spiny-type cast iron liners (the 2UZ had a traditional cast iron block). The new block has the same 90-degree 'V' angle, 105.5 mm bore pitch and a 21.0 mm cylinder bank offset. The 1UR-FE kept the bore size of 94.0 mm while the stroke was slightly reduced to 83.0 mm. The engine got the new a forged steel crankshaft. This crankshaft has only six balance weights while predecessor’s crankshaft had eight balance weights. In this case, the 1UR-FE has less smoothness in operation. So for reduction of noise and vibration, the 1UR crankshaft pulley has a torsional rubber damper. Also, the engine has a forged connecting rods and aluminum pistons with a resin coating. The 1UR-FE already is equipped with four oil jets in the cylinder block to cool pistons by oil. The design layout of cylinder heads was completely revised. The engine now has an aluminum alloy cylinder heads with separated camshaft housings. There are two camshafts for each cylinder bank, four valves per cylinder. But here is the second key feature of the new engine: the 1UR-FE used timing chains (no unreliable timing belts). Primary timing chains drive the intake camshafts, which operate the exhaust camshafts by a secondary timing chain on each head. The exhaust and intake valves are actuated by roller rocker arms now, and the valvetrain is equipped with hydraulic lifters (no valve clearance adjustment required). Between the cylinder block and each head, there is a three-layer steel-laminate type cylinder head gasket. The 1UR-FE engine has Toyota’s Dual VVT-i system that controls both intake and exhaust camshafts, as well as the already familiar systems such as Acoustic Control Induction System (ACIS), Direct Ignition System (DIS) with long-life iridium-tipped spark plugs, and Electronic Throttle Control System - intelligent (ETCS-i). The engine uses the L-type sequential fuel injection (SFI) and the twelve-hole fuel injectors. The exhaust system consists of the four-into-one (4-1) stainless steel headers, stainless steel exhaust pipes and catalytic converters for both left and right cylinder banks. The reduce emission there is the water-cooled Exhaust Gas Recirculation (EGR) system and the air injection system for faster warm-up of the catalytic converters. Despite the fact that the new engine has nothing similar with the 2UZ-FE, they have joint problems. The water pump is still a source of leaks and issues. It has a short life – 60,000 miles (100,000 km), and it’s gone. Sometimes the hydraulic chain tensioner fails, loosening the timing chain tension. In the early years of production, the engine was equipped with too thin unreliable valve springs. Some owners complain about increased oil consumption - up to 0.5 liters per 1000 miles. But in the rest, the 1UR-FE engine has excellent longevity and durability, almost the same as the 2UZ-FE. The 1UR-FSE Engine. The 1UR-FSE engine is a more technologically advanced version of the 1UR engine. This version has D-4S (Direct-injection 4-stroke Superior) injection system that featured one injector in the intake port and a second in the combustion chamber for each cylinder. The D-4S can provide direct injection mode only and both direct injection and port injection at the same time. The engine has increased compression ratio - 11.8:1. The 1UR-FSE efficiently replaced the 3UZ-FE in many Lexus models.